Buffer, orientation selection and elevation of caps at high speed rate in one machine. This equipment can easily be connected to any capping machine. 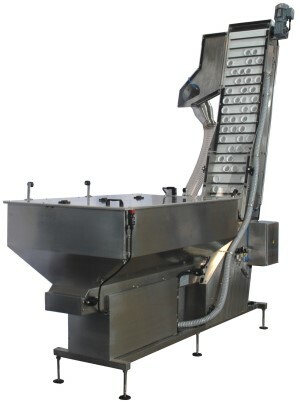 Due to its working principle, this machine is suitable for flat caps only. Several versions for up to 1000 caps per minute (depending on cap size). 400 or 700 liter hopper. Discharge height as per request. Continuous running with cap overflow return in selection bin. PP belt conveyor with product supports. Clear covers on hopper and conveyor. Exit on right or left side to suit the whole line layout. Hygienic design, wash down safe (IP55).